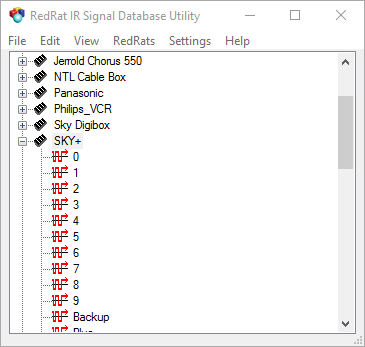 A core program for use with both the RedRat3 and irNetBox, the IR Signal Database Utility Supports the creation, viewing and testing of IR signal datasets. What is a signal database, and why may you want one? It is your local set of IR remote control signals that you use and work with, made up of one or more remotes (e.g. TV, DVD_PLAYER) each with a set of IR signals. These are usually captured directly from the original remote control unit via a RedRat device, analysed and then stored in an XML file. Sharing remote control data with others. Using datasets in RedRat applications or your own applications developed with the RedRat SDK. The testing of signal decoding when inputting IR signals. Using datasets to control your TVs or STBs via RedRat devices. An IR signal dataset is basically a copy of the IR signals produced by your remote control unit. These can then be transmitted to control your TV or STB, or are used for comparison when decoding input IR signals. The process of creating a dataset from your remote control unit is often referred to as learning or capture. We recommend using either a USB RedRat3-II or a RedRat-X for IR capture, though an irNetBox can be used as well. Create a new device/remote node from the Edit menu. Add a signal to the device, which will bring up a dialog box. Press Learn IR, and point your remote control at the IR input on the RedRat device. For most types of IR signal, one has to press the remote control button twice. Test the quality of the captured IR signal by outputting it again to see if it will control your TV/STB. This is done by selecting the signal and using the Edit > Test Signal Output menu item. This process can be quite laborious, so the wizard can be used instead. This is started from the Edit > New Device/Remote Wizard menu item, and allows you to edit the list of IR signals to capture, then starts a loop for capture of them all. Obtaining an accurate IR signal dataset is very important as the reliability of operations using this data depend on it. Therefore investing a little time in ensuring that all IR signals are correctly captured can save a lot of time later. IR signal waveforms can be viewed by double-clicking on an IR signal and selecting the IR Data button, bringing up the waveform viewer and editor. A certain amount of data editing is also possible, for example adjusting the number of repeats. The aim of signal decoding is for use in applications which controls PC operation from several meters away using a remote control handset. Examples could be PVR applications, Powerpoint displays etc. The primary RedRat application for use here is RedRatControl. As with IR signal output, reliable signal decoding depends on good quality IR data, but also on some understanding of the IR protocol used. RedRat software uses a general purpose decoder which works well for a good proportion of IR signals, but not all. So to test how well it works with your dataset, open the decode window from the View menu item, point your remote control at the RedRat and press some of the buttons. If it can’t decode them or they haven’t been captured, then an “unknown” will be shown. We do have additional decoders for certain types of IR protocol not handled well by the default decoder, so please contact RedRat support for more information about this. irNetBox Signal Data: This is for code which directly implements the irNetBox communication protocol. The export process creates the data blocks for download when outputting IR signals. If using RedRat applications or the SDK with an irNetBox, then the standard XML format can be used. Pronto Format: Used by some IR applications, this export option attempts to convert the IR data to this format. LiRC Format: For use with the Linux IR remote control infrastructure. IrOuptut Format (Linux): For use with RedRat’s Linux IR output tool. Added support for improved IR capture in RedRat-X firmware version 0.6.0. Various core code fixes and improvements. USB RR-X set as default device. Fixed a bug on export of data in irNetBox format. Default RedRat saved across sessions. Added search by IP option. Fixes a bug in viewing DoubleSignals in the signal viewer. RS001-2274: No longer attempts to learn XMP type signals using an irNetBox. Options dialog window added. irNetBoxes can now be ignored in RedRat device search. Additional minor fix to LIRC signal export. Fixes to signal export issues. Improved disposal of writers on file export. Fixes to XML signal display. Fixes to LIRC signal export. A bug in subtle aspects of XMP signal calculations resulted in incorrect data being shown in the signal viewer. Now fixed. Double or toggle signals did not work correctly when testing their output. Now fixed. Fixed a bug in signal comparison code. Added import of irNetBox text formatted data. Added File -> New menu item. 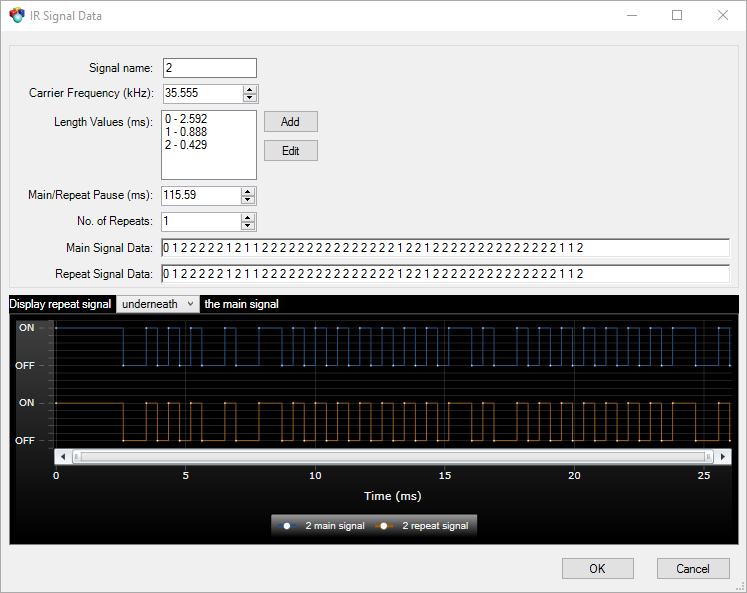 Can view and edit XMP signal parameters in the signal viewer. Signal editing is managed somewhat better in the signal viewer. XMP1 parameters are shown briefly in the signal input dialog window. Supports irNetBoxes with the new XPort-05 version. Further information on this is available here. An option to automatically load the last file used on startup has been added. Improvement in parsing Pronto IR signal data. Can now export ir-output and LIRC formatted data for DoubleSignals. The decode window now gives timestamps when logging IR signal input. When outputting very long IR signals (greater than two seconds), the USB timeout is automatically adjusted so that there is no USB communication timeout error is generated. The export of empty IR signals in irNetBox format would cause an error. This is now fixed and a list of empty, non-exported signals is given to the user. Exports datasets in the IrOuptut (Linux) format. Added a graphical viewer for IR signals. Can drag and drop signal DB XML files onto main window to open/add. Handling of XML device and device DB files is a bit more intelligent. Added experimental export of datasets in Linux LIRC format. Does NOT now require administrator privileges first time that it is run. If two network interfaces on a PC, it used to add an irNetBox twice (or crash). Now only adds the irNetBox once. Improved unhandled exception management and user notification. Supports the setting of LOW, MEDIUM and HIGH power output levels on irNetBox-IIs. This requires irNetBox-II firmware of version 2.03IP or higher for reliable operation. Bug fix – if test signal output pressed multiple times, multiple output threads would be started. High speed capture mode for keyboard type signals is supported on the RedRat3-II. This requires the RR3-II firmware to be V1.08 or higher. Input of XMP signals caused the application to crash – now fixed. Built so that it works on 64-bit XP & Vista Windows in addition to 32-bit systems. Added export in Pronto signal format (not guaranteed to work with all signals). Fixed bug in export of IR signals in the irNetBox format – didn’t work if more than 16 length values in the signal. Double and toggle signals correctly exported for RR2 format. When exporting IR signals with “toggle bits” as data blocks for the irNetBox it now creates two signal data blocks, one for each toggle state. Supports the high speed capture mode of RR3-IIs. Needs RR3-II firmware version 1.04. Supports the USB version of the irNetBox-II. Fixes a bug causing the application to hang when an irNetBox is set to IP_ADDRESS lookup, but is not actually available on the network. An update program can be used to update your RedRat hardware to the most recent firmware version. Supports the RedRat3-II in addition to older RedRats. Fixed null pointer exception when trying to read/write signal capture params when no RR found. If don’t have any RedRats, then one is added, a new search will now set the default RedRat to the first one found. Added support for capture of XMP-1 IR signal datasets. Export of data in irNetBox format changed slightly. Each data line now includes a keyword indicating IR signal type: MOD_SIG, IRDA_SIG etc. Better error handling for pronto signal input. Miscellaneous small improvements to the underlying SDK code. First .NET 2.0 version to be released. Small improvement in IR signal decoder. Added support for the USB version of irNetBox. Improved comms with the irNetBox. Supports the latest version of the irNetBox. Improved selection in signal tree view. Fixed bug that caused exception on decode window opening with no RedRat device attached. Fixed bug causing null pointer exception with decoder when editing device properties. Signal decoding was still not working properly – sorry! Now fixed. Supports newer irNetBoxes that use the “X2” version of the XPort. Fixed a bug causing an exception on creation of a new device. Fixed a bug in signal decoding. Added support for adjusting the RC correction parameter. Better support for RedRat2 data files. When learning IR signals from an irNetBox, it attempts to connect to it automatically. Includes a new device/remote wizard for more efficient IR signal capture. Does a late-connection to irNetBoxes rather than connecting on startup. Added support for Keyboard-type modulated signals (i.e. signals with 3 parts, key press, key hold and key release). Added support for output of FlashCode signals. These have pulses of non-modulated IR, i.e. no carrier frequency. Added import of device/remote data from the RedRat website. Added export and output of IrDa type signals for irNetBox. Added drag and drop support for AVDevices as well as IRPackets.